Atle Østrem (1980) is an artist from Stavanger, Norway. He now lives and works in Oslo. 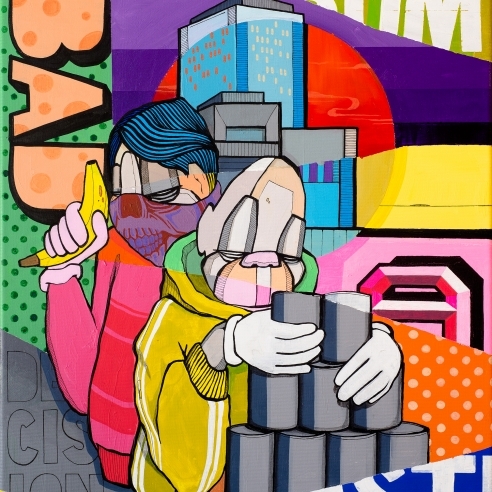 Østrem has been painting graffiti since the mid-90s and has been doing artwork on canvas since 2000. Fascinated by the contrast between ugliness and beauty, he likes to explore and work in the “beauglyful” zone that takes place when you combine the two. His strong iconic existential characters are both playful and dark, childlike and thought-provoking,.They inhabit an interior world and capture those often fleeting elements of daily life and emotion, that once we shine a spotlight on them, have the power to truly show us what it means to be human. Atle Østrem does not consider himself a street artist, nor a fine artist, but something in between. Something beauglyful.